​Perhaps we can all agree that keeping our cars clean is very important, no matter where we come from, and who we are. But let’s face it, regardless of how much effort you put into it, your car will inevitably end up dirty. Normal stains aren’t hard to remove, all you have to do is give them a good scrub. But what do you do when there’s tar? That’s an absolute monster to get rid of! Luckily, there are some foolproof methods as to how to get rid of tar once and for all. ​First, you will need to moisten the microfiber towel with tar remover. Be careful not to soak it. Dispense the tar remover evenly and just enough- you don’t want your towel dripping. In case the tar spot is too big, you may apply a normal amount of tar remover directly to it. ​Next, place the towel over the tar spot and wipe in small circles. You will feel the tar dissolve and loosen under the light pressure you put on it. When the towel gets dry and dirty, flip it over to a clean section and continue cleaning in small circles. If you’ve done a good job, you should see some streaks left from the tar after you remove the towel. Simply wipe them off. Then check the rest of your car for more tar spots. Be thorough. If you do find any more, remove them in the same way it has been explained above. ​Once you’ve made sure you’ve cleaned off all the tar, it is necessary to wash your vehicle. This is where the detergent and bucket come in place. Use lukewarm water to wet your car then wash it thoroughly with the detergent and towels. After that, simply rinse your car. Be sure to start from the top. Finally, wax your car. This might look like an unnecessary step but, trust us, you’ll be thankful you took the time to do it. Waxing isn’t hard and it’s very useful since it helps protect the paint on your car. Waxing it may also prevent other things to stick to the exterior the next time you take it out for a drive. ​If the first method hasn’t worked or if you’d like to try something different, using materials that you can mainly find at home, we advise you to try this method instead. ​First of all, choose between the tar remover, peanut butter, WD-40, and goo gone. Got your pick? Take it and spread it generously across the tar stained areas. Let it sit for around one minute. This will loosen the tar and make it easier to wipe away. ​Next, you will need the soft cloth or microfiber towel. Apply a normal amount of pressure and rub in a circular motion over the dosed stain. If the tar doesn’t remove easily, stop wiping. Apply more of the same product you did before and wait for a few more minutes. That just means the tar is stickier than it lead on, but it still won’t stand a chance. ​Try wiping it away again, and if you still fail, repeat the process until you succeed. Now that you’ve removed the tar, make sure you didn’t miss any spots on any different sides of the car. If you find any more tar residue, repeat the first two steps. ​So your car is now clean from tar but you still have leftover product that you used to clean the previous mess. No problem! Get your bucket and fill it with lukewarm water. Get a clean cloth or microfiber towel and wet your car. Remember to start at the top, because if you don’t, you’ll need to wash the bottom part twice as all the dirt from the top will slide down to it. Now it’s time to apply the detergent or soap and gently but methodically wash your car. If it’s easier, divide the car in sections and complete washing each section before moving on to the next one. Once you’ve spread the detergent evenly and wiped away all the stains, it’s time to rinse. Take the water from the bucket and rinse out every part of the car. Make sure to get all the nooks and crannies as you do not want soap to eat away your paint. ​Finally, it’s time to wax your car. We’ve already mentioned why waxing is an essential part of the process and how it helps your car stay in prime shape. The tricky part about wax is spreading it evenly across the whole car, but other than that it’s an easy step. A piece of additional advice would be to use more wax on any parts you may have scratched while rubbing the tar off. Buff out the scratches with a soft cloth before using the wax to cover them and make them shine. ​So you’ve reached the end of the article. Tar isn’t the stickiest material that can get stuck to your car, but that doesn’t mean it’s any less annoying. That’s exactly why the aforementioned and explained methods have been invented. The good thing is that you can try more than one method, in the unlikely case that you can’t get rid of the tar. 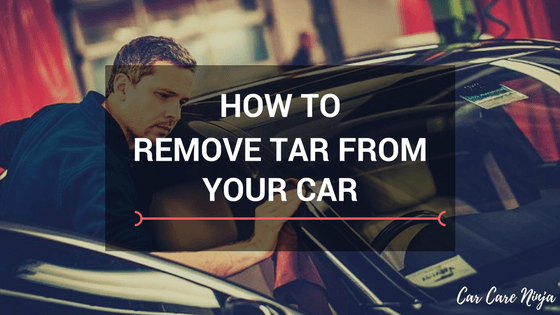 Hopefully, these steps will help solve your tar problem and leave your car spotless. ​Good luck and happy driving!